A co-worker1 brought these baked mini doughnuts to a potluck back in the Spring, and I ate about a dozen of them because they were so good, and I pestered her for the recipe until she surrendered it. But itâ€™s been a busy year, and my dreams of mini doughnuts were put on hold. Last week I finally got myself over to good olâ€™ Tap Phong to buy some mini doughnut tins, and yesterday I found an unexpected gap in my schedule (Iâ€™m part of the team running the Toronto Christmas Market this year, and itâ€™s been a fun, busy time), so I whipped up a batch. Repeated testing on our event coordinators, stage crew, and technical staff has proven that they were a success. Iâ€™ve altered the recipe somewhat, and will probably try variations (I might cut down on the sugar, or try adding cocoa for chocolate doughnuts), but the basic recipe is very, very good. Preheat your oven to 350 F.
In a large bowl, mix together the dry ingredients. In a small pot, melt the butter on low heat until liquid. Mix in the milk, vanilla, apple cider vinegar, and egg. Stir until blended. Pour the wet ingredients into the bowl with the dry ingredients & lightly mix until just blended (don’t over-mix – it makes for a denser doughnut). Place just under a teaspoon of batter into each section of mini donut pan. You’ll need to use your fingers to smoosh it around in the pans. This batter rises, so don’t fill each doughnut any more than half-way. Bake for 12 minutes. Cool baked doughnuts on a wire rack. For icing: mix the icing sugar & milk together in a bowl. 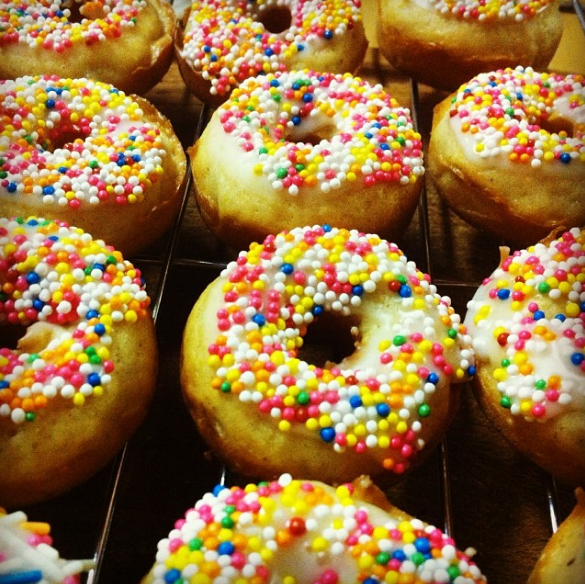 Dip the doughnut in the icing, and then into sprinkles.